"Thus far, it has been one of the greatest decisions I've ever made. The bike was brand new, but even so, had a few problems when I got it delivered to me. The headlight was already burnt out. Two fuses were blown. I ended up tinkering with the bike, and basically taught myself how to change out these parts on my own. "For me, this was a HUGE accomplishment, and signaled the dawn of a new era in my life: gone were the days of not knowing or caring a thing about the mechanics of a vehicle; gone were the days of the constant neglect and lack of appreciation for the machinery underneath me; gone were the days when I would rely on someone I knew, or a mechanic, to take care of even the most routine and minor issues. "The phrase that I'd heard repeated ad nauseam on Enfield forums across the Internet, 'Enfields turn men into mechanics,' was becoming a reality for me. 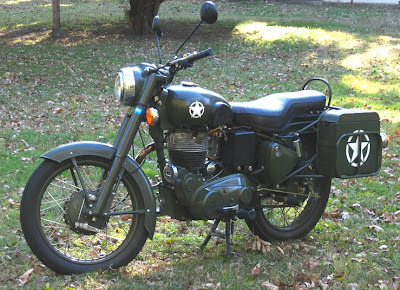 "It has been about two months now that I've owned my Bullet. I've replaced the headlight twice, and have replaced four blown fuses. I'm almost positive that I have a regulator putting out too much energy, and a loose wire or two slapping against the frame. My dealer is sending me a new regulator for the bike, which will arrive in about a week. Further, I have just put about 500 miles on the bike, and it's time for my first service and maintenance. "I've decided, for better or worse, I'm going to attempt to do all of this on my own. I'm a fairly intelligent guy, and can usually trace the source of a problem from Point A to Point B. I think with the guidance of a well-informed and enthusiastic Enfield community and the right tools, I can get the first service accomplished on my own. "As far as riding the Bullet, it has been nothing short of fun, fun, FUN! I absolutely love it. I've been very meticulous about the break-in period, but have thoroughly enjoyed riding the bike slowly through gorgeous back roads here in the heart of farm country in southern Kansas. Every time I ride, heads turn, thumbs point up in the air, and hand waves abound." Next: Riding with Josh Moore. Small world. I was recently at a small RE dealership in west central Missouri, looking at a couple of Bullets--one still in the create--and the dealer was explaining the warranty infrastructure of RE, since they had so few dealers, and told me, for example, he had a recent buyer who needed a new regulator--so he just mailed it to him. So, Josh, I wish you luck down there, and have fun! We were looking for a bike for my son, and bought a used Ninja, but I swear, I am next! Indeed a small world, Roy. Cool story...can't believe you ran into the same dealer. I wonder what your thoughts were of him (I assume you spoke to Randy) and the dealership itself. I had a few problems with my brand-new bike upon arrival, but I think Randy's been doing good to take care of me. Most young guys want Ninjas. Two of my friends just bought one, but whenever we ride, I always get the looks, questions, and comments. There's something to be said for standing out, and there's something to be said for a bike that's light and nimble and perfect for cruising around on back roads and just having fun. The Bullet is just so satisfying. We like the Ninja. Definitely not the same genre as any of the Royal Enfields. It is a sweet, high tech machine, really. No complaints. I spoke with Randy over the course of several phone calls before we drove down there. He struck me as a good guy--I trust him and would go out of my way to do business with him again. Keep us posted on your Royal Enfield adventures! Josh, I know the Enfields draw smiles, waves and just general positive reactions from those we pass on the roads. I even had a guy I was approaching in a truck start frantically waving for me to stop and as I approached. He jumped out with a big smile and wanted to talk about the bike. Now if you have the regular "delay factor" while riding it is understandable but if you feel that it is more than you can just attribute to the Enfield's mystique I suggest it is also probably due to that beautiful woman who is seen in the pictures you posted...so if she is on the bike with you expect more than the occasional smile, wave, grin, etc. Have fun and be careful, there are some crazy cell talking drivers out there!! is well worth a read and not just because of his girlfriend, who must be quite a woman indeed. My wife called Josh's blog "one of the great things you find on the internet." anonymous: I agree, there are far too many crazy 'cell talkers' out there, and I must admit I used to be one of them. Riding a bike has made me a much more responsible 'cage driver' -- obviously a good thing for me and for other bikers. David: I thank you and your wife for the compliments on the blog. I wish I had more time to devote to the blog like you do with yours. I think your blog is a fine example of everything a blog should be. My academic life keeps me far too busy to devote nearly as much time to my blog as I would ideally prefer, but I won't hesitate to keep the blog 'well-oiled' and running on any and all upcoming adventures.